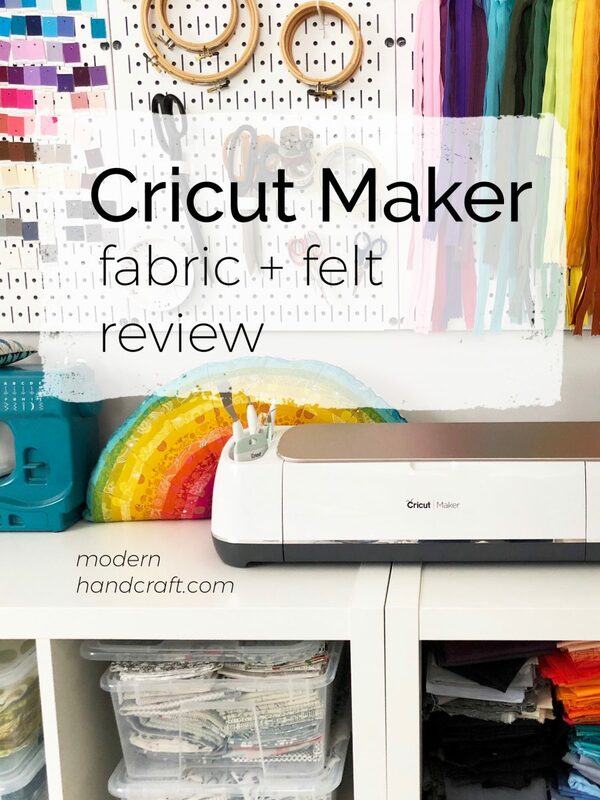 I received a Cricut Maker a few months ago and wanted to give it a thorough review sharing my thoughts on the materials I cut most - fabric and felt. Most of you who follow this blog are avid sewers and crafters and these are also the materials you are most interested in hearing about in deciding if this is a good tool to add to your sewing space. I have owned a Cricut machine in the past - which I was super excited to buy, then I made a quick project...then it sadly collected dust. This happened mainly because most of the items I could cut with fabric had to be backed with a fusible interfacing and I was not able to cut out felt - the two materials that work with the most. It was an incredible machine if I had the need for making fun items with vinyl or iron on materials, but lets face it I was quilting more than anything and this sadly went unused. 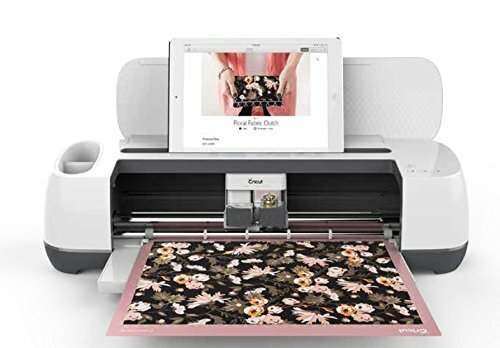 Fast forward to the Cricut Maker - I first saw the machine on social media when it was introduced last year at a Cricut event. The biggest draw was the fact that it now included a small rotary blade where you could easily cut fabric without the need to iron on fusible interfacing. Well, this is what I had been waiting for. I watched several videos showing Riley Blake sharing all of the quilts you could make with the product, several well known bloggers who were there for the event testing out the product and they made it look too good to be true. Now I have a machine in my hands with the opportunity to see if it in fact is as fantastic as they all made it sound - and I am hooked. Let's get down to the thing you want to know about the machine - the mini rotary blade. This can cut through so many materials - cotton, fleece, felt, denim + more. 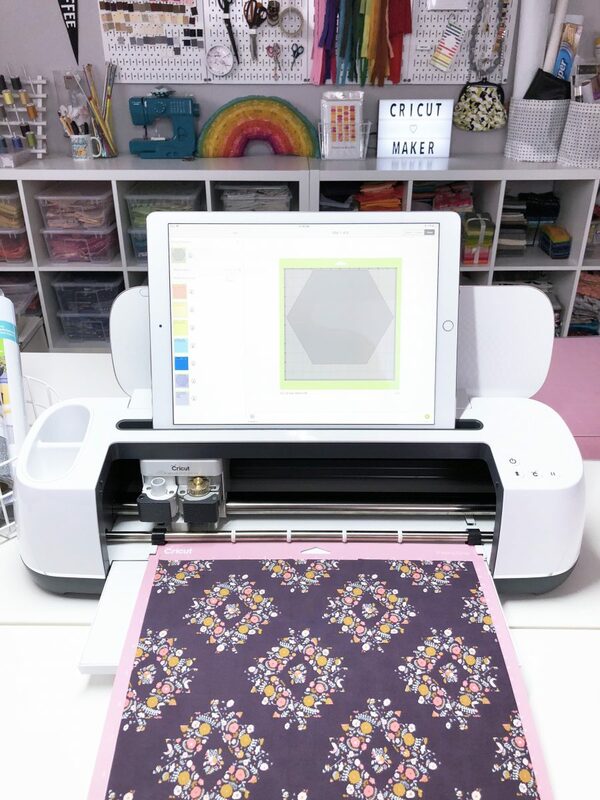 I wanted to test out the larger fabric cutting mat that measures 12" x 24" and create one of the free projects listed in the Cricut Design Space - Tabletop Tool Caddy. This looked like a fun project and I actually had a bit of pre-made bias tape and the perfect fabric so let's see how it turned out. 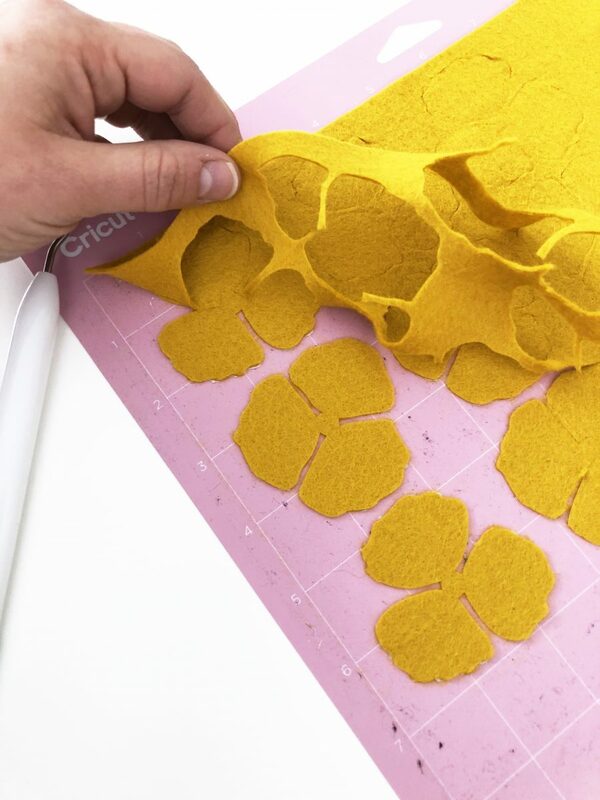 It was super easy - and gives you the size to pre-cut your fabric so you will not have wasted materials. The machine comes with a washable fabric pen, that marks where you will place your fabrics together to sew. You can see where the places are sewn together to make the pockets - those were drawn for me with the washable fabric pen. I will be honest, I loved this at first, but it did take some time to actually get the marks out using a spray bottle of water I had. I am guessing it comes out much better if you really soak the project. I just found this to be a little unfortunate. Instead of going under my Cricut Maker machine, I am using this tool caddy under my sewing machine to hold all of the little tools I use while sewing. The fabric mats shown behind the machine above come in two sizes - 12" x 12" (included with the machine) and 12" x 24" - sold separately. Below you can see a free project I started working on making a hexagon shaped quilted pot holder. This shows the first cut, and on the left side of the i-pad screen you can see all of the mats and what materials we will be cutting next. So you can preload fabric mats with your next fabric to cut and be ready - it also shows where on the mat it is going to cut, so you can see how large a piece of fabric that you need - less waste. I really wanted to test the fabric cutting ability so I chose an Art Gallery fabric which is known to have a super soft almost silky feel. You can see above that it cut like a pro - even on those corners! No fusable material is needed on the back of the fabric, so its perfect for prepping quilt blocks to cut. There are also one-click pattern purchase options from Riley Blake and Simplicity. Simplicity offers so many sewing projects and clothing items, due to the size of the mats I believe they might be on the smaller size. Next up I wanted to try cutting felt, the other material that I frequently use. I did a search for felt flowers in the Cricut Design Space - this led me to Felt Flower Baby Headband. I loved the flower shown and wanted to test the ability to edit the project and see if I could fit the design onto the size felt I had to use. It was easy to add flowers by editing the project copies to 4 (the number of flowers I wanted) and then click on the images on the mat to move to the size of felt I was using - 9" x 12". Spoiler alert: It was AMAZING! I used to spend hours cutting out wool felt by hand to create projects - and look how awesome it did with the felt. This pretty much sold me on the machine, I knew it could do wonders on fabric, but wow - this impressed me quite a bit. Using wool felt did leave behind a bit of mess on the mat, I am not sure if this is easy to clean off or will affect the "stickiness" of the mat in the future. So far I have had no issues. I finished cutting out the flower middles and the leaves and decided to try out the Cricut Design Space and cut out an "n" by choosing the font I liked and sizing it up. That was also a bit too easy - note to self, Nicole make something cute with your son's name on it next. Here you can see what I whipped up using a free pattern some felt + hot glue and a little creativity! The one feature that isn't the most interesting but one that I have found to be my favorite is the fact that it is bluetooth enabled. This means you can pair your smartphone or tablet via bluetooth to the machine and make a project! The one thing that drove me crazy with my first machine is installing the program onto my laptop and finding the cord to attach it to the machine and then figure out how to use the design space. This is SO EASY. I can play on the design space and create a project on the app and send the project to the machine that is across the room. Not that you would want to do that - but it just shows how effortless it is to work with the machine, and I love it. Use your own designs! You can upload and import your own images and fonts for free, in a variety of file formats. Knife Blade - this blade can cut chipboard, balsa wood and mat board. These are materials I have yet to work with, but having a son in school and future crafts/projects to work with him makes this a fun possibility. Also there are some photos I need to mat / frame....so maybe I can share a review about that soon! Also leather....did I mention that? I am dying to make something with leather and am pretty excited about the opportunities this is going to open up. Dock to hold your tablet or smartphone that also lets you charge your device with included USB port. 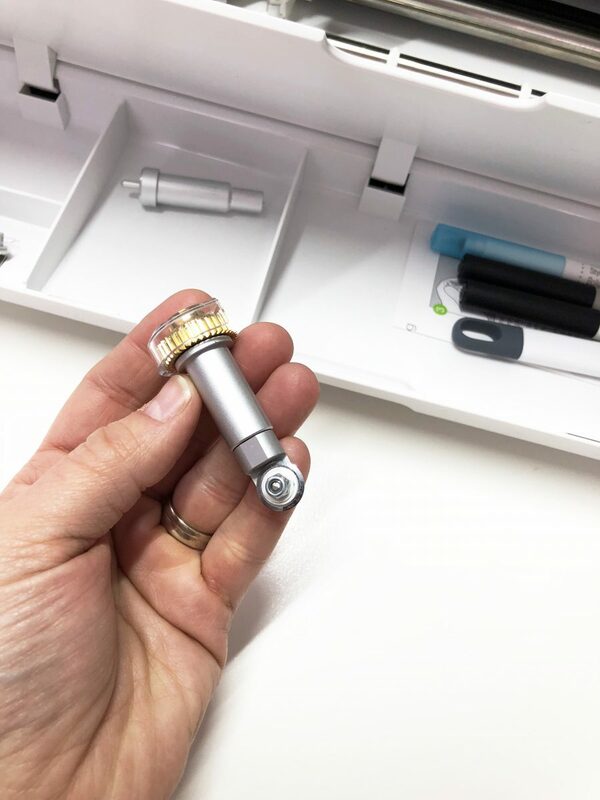 There are also storage spots in the front area that folds down and on the side to keep markers, tools and other blades so nothing goes missing. What comes with the Cricut Maker Machine? 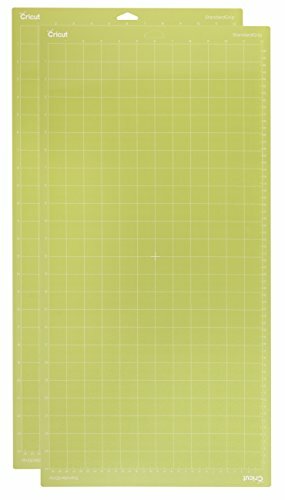 fabric grip mat 12" x 12"
light grip mat 12" x 12"
If you are going to be using this to cut fabric, I would highly recommend purchasing the fabric grip mat that measures 12" x 24". In review I can definitely say this is the ultimate smart cutting machine. 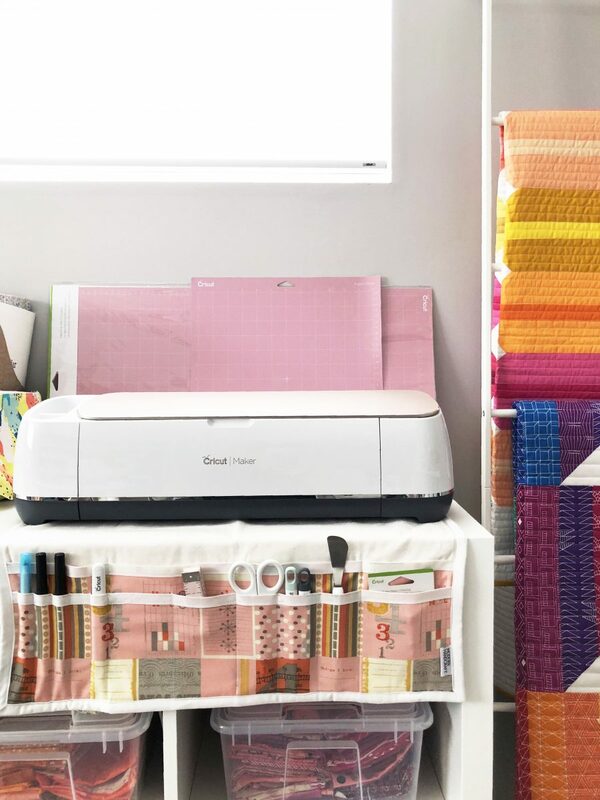 It includes so many more tools than prior Cricut machines I have used and the ability to cut hundreds of materials has opened up more sewing and quilting possibilities as well.